Baptised: 5th July 1868, at St. Margaret’s Church, Lowestoft, Suffolk. Parents: Mary & Samuel Chamberlain, a Mariner. Died: 13th August 1915; age 46; Died at Sea. Drowned Dardanelles, Aegean Sea, aboard ‘Royal Edward’, following torpedo attack by enemy submarine. Served 361 days. Residence: 4, Victoria Street, Ipswich. Edward was a member of the St. John’s Ambulance Association, and he had got two first-class certificates. His interest in the St. John’s Ambulance led him to join the Casualty Clearing Station last August. Enlistment Details: Location: Ipswich; Date: 18th August 1914; Age: 45 years & 2 months; Occupation: Sawyer; Religion: CofE. 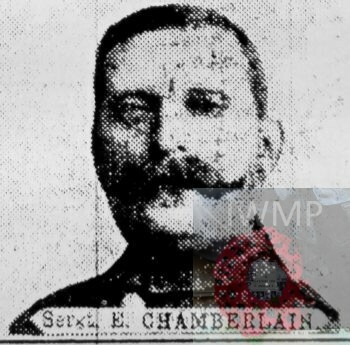 Next of Kin: Mrs Chamberlain – 4, Victoria Street, Ipswich. Height: 5ft 8 ins, fair complexion, blue eyes & light brown hair. Tattoos – flag & star on front left leg & E.C & C.C back of left forearm. Promoted: Corporal – 10th February 1915. Promoted: Sergeant – 8th March 1915. Regiment: Royal Army Medical Corps, East Anglian Casualty Clearing Station. Previously – Royal Engineers – Termination of Engagement. Medals Awarded: South African & King’s Medals. Victory, British War & 1914 -1915 Star. Panel 199 and 200 or 236 to 239 and 328. Relatives Notified & Address: Husband of Alice Chamberlain, of 19, Sirdar Road, Ipswich. 1871 5, Mill Road, Kirkley, Suffolk. Edward was 2 years old and living with his parents, brothers & widowed paternal grandmother. James Samuel Saul Chamberlain, 34, a Bridge Man, born Lowestoft, Suffolk. Mary Chamberlain (nee Cooper), 38, born Burgh Castle, Suffolk. William Clarke Cooper Chamberlain, 11, born Lowestoft. Samuel Joseph Robert Chamberlain, 9, born Lowestoft. Mary Chamberlain, 70, Annuitant, born Lowestoft. 1881 Horne Hill, Kirkley, Suffolk. Edward was 12 years old and living with his parents & brothers. Samuel, 42, a Dock Gate Man. William, 21, a Block Maker. Joseph Frederick C. Chamberlain, 4, born Kirkley. 1891 Brompton Barracks, Gillingham, Kent. Edward was 25 years old, a Soldier ranked Sapper for the Royal Engineers. In 1901, Edward was away with the Royal Engineers. His wife was living with her parents, sisters, brother-in-law & nieces with their 2 young children. at 14, Ashby Road, Lowestoft, Suffolk. William Wright, 65, a Bricklayer’s Labourer, born Ludham, Norfolk. Eliza Wright (nee Catchpole), 66, born Kessingland, Suffolk. Alice Chamberlain (nee Wright), 30, a Net Worker. Margaret Horne (nee Wright), 29, born Lowestoft. Albert Horne, 28, a Grocer’s Warehouseman, born Norwich, Norfolk. Florence Horne, 6, born Lowestoft. Alice Horne, 3 months, born Lowestoft. 1911 10, Pauline Street, Ipswich. Edward was 44 years old, a Platelayer – Railway. He was married and Head of the Household. Ethel, 17, a Tobacconist Assistant. Edward, 15, an Errand Boy – Butcher. On the 12th March 1886, 18 year old, Edward joined the crew of the ‘Moss Rose’ a coasting barge (registered at Weymouth, owner – Richard Cox, of Castledown, Portland, Dorset). Master – Henry Strange, of 5, Natal Terrace, Wherstead, Suffolk. Edward had last served on the ‘Green Nymph.’ On the ‘Moss Rose’ he was a Cook, and earned 1.10 a month. Ethel May Chamberlain, born June 1893, born Lowestoft. Edward Ernest Chamberlain, born 1896, Ipswich. On the 19th January 1921, Edward’s Hymn Book & New Testament was returned to his family. Soldiers’ Effects to Alice Chamberlain – widow & Mrs. Ethel M. Cook – daughter. Edward is also remembered on the war memorial under Transport at the Town Hall, Ipswich.